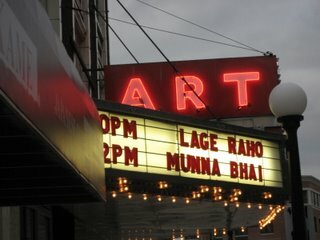 I saw Lage Raho Munna Bhai in the theater today and it was the most fun I've had at the movies since I don't know when. The house was almost full and everyone was having a grand time, laughing and yelling crying and clapping. Abby and I were the delighted companions of four Indian fellows (and no, we don't just canvas the streets looking for desis to take to the movies - we met them properly yesterday at an office party, bonding over a shocking lack of bhangra while dancing badly to a remix of "Push It"), all of whom kindly leaned in here and there to make sure we were understanding everything. Speaking of which, these were some of the best subtitles I've seen in a long time. Of course I don't know if they were accurate, but they seemed to line up with the audience reaciton far more often than they usually do, and I only noticed one spelling mistake ("old foggies" for "old fogies," although now that I think about it that could have been a subtle joke about the mental state of Jhanvi's friends). On a wee serious note, the movie made me realize how little I actually know about Gandhi (can't even spell his name right half the time - the wily Hindi "H" will be my downfall yet). This summer I visited his ashram in Ahmedabad and the Mani Bhavan in Mumbai but not a lot sank in - in both cases my brain just was not in a state to really engage with any important learning, distracted by other things. My favorite parts of the message of the movie were that 1) we can honor the people who are important to us by keeping them in our hearts and 2) we all have Gandhian ideas inside us and can act on them simply by thinking about them and realizing their efficacy and relevance. Anyway, funny, charming movie, full of strong performances (Sanjay Dutt did such a great job of portraying that dopey, hugs-you feeling of when you find yourself twitterpated and you just want to sit and stare at the sea and indulge in it), that delivers a relevant message without indulging in mawkishness or a heavy hand. Right on. And we got to see the Don trailer not once but twice! I hadn't realized Arjun Rampal was in it. Bleh. It's coming to town the first weekend in November, so I will definitely not be out of town visiting my parents like I was last year for Salaam Namaste. And yes, that noise you heard at about 3:00 central time was Abby and me squealing with delight when we saw Abhishek. According to my database - I know what you're thinking: it's either 1) "What an unbelievable geek!" or 2) "I thought it was a spreadsheet?" - this is my 100th Indian film. Hurrah! No no no, you missed the point, which was ARSHAD WARSI ROCKS. And wtf is a FPMBF? Btw, if you're interested, I've done ONE Bollywood movie on my blog. Back in Feb or March or whatever. "Gab-rio-let", I think. Au contraire! The point already made itself. In my book, that would be like saying "Sunny Deol cannot dance" or "Shahrukh cried." F(ake) P(retend) M(ovie) (B)oy (F)riend. An indulgent passtime. You may of course have a FPMSignificantOther of your choice, but as we have been discussing here it helps to call dibs. I gather you want someone with non-hairy arms? YAY! Oh, I just relived the movie reading your post, the special appearance made me squeal too (but quietly). And I want a Circuit of my own! Also, congratulations on hitting 100, wah! I think I'm just nearing my 30th, so I have a looong way to go yet. Where did my comment vanish? Too bad! Aparna - don't know? Is it on a different thread? Boo hoo! Jeff - thanks! I'll come have a look. I never knew the word 'twitterpatted'...but somehow the sound of it, explained itself, and yeah, felt that lots of times, and exactly as you described. What a movie to watch for your hundredth. Congrats Beth!! and hurrah for you - 100th BW movie, and what a choice! Hey Sunrise - it's in downtown Champaign, Illinois! It typically shows art and foreign films, but it also hosts all sorts of local film fesitvals (a Korean film festival is coming up, for exmaple) - and the sporadic series of Hindi films too. I just realized that you'd probably seen this movie too. Lo and behold, you had! I'm so glad you liked this movie as well. Man, it must have been so incredible to see in a movie theatre. I love it when audiences are enjoying the movie along with me. And I was so pleased with the quality of the subtitles. They rocked. I'm doing a double take here - have you or have you not seen Munnabhai MBBS?